Looking for more crazy cool cyberpunk TV shows like Altered Carbon? If you love the mind-bending Netflix Original, you’re going to love these other amazing twisty sci-fi shows! Altered Carbon is a cyberpunk, dystopian, sci-fi television series that is based on the 2002 novel- of the same name- by Richard K. Morgan . The series arrived on Netflix on February 2, 2018 and stars Joel Kinnaman, James Purefoy, Kristin Lehman, Hayley Law and Leonardo Nam. 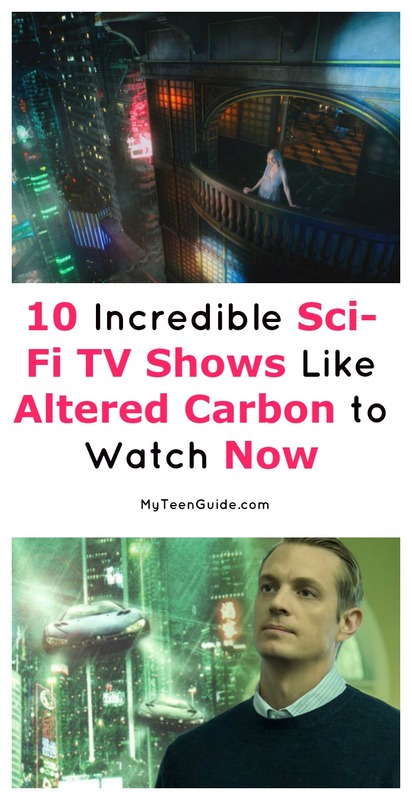 Here are some TV shows like Altered Carbon for you to enjoy! Almost Human is a crime-drama, sci-fi television series that aired on FOX for 1 season, from 2013 to 2014. Set in the year 2048, John Kennex, a human and Dorian, an android, team up together to protect and serve. Almost Human stars Karl Urban and Michael Ealy. Caprica is an action, cyberpunk, sci-fi television series that aired on SYFY for 1 season, in 2010. It is a spin-off of the Battlestar Galactica television series. Set 50 years before Battlestar Galactica , Caprica features two families- the Adamas and the Graystones- living together on the planet, Caprica. Caprica stars Eric Stoltz, Esai Morales, Paula Malcomson and Alessandra Torresani. Continuum is an action, drama, sci-fi television series that aired on Showcase for 4 seasons, from 2012 to 2015. Set in the year 2012, Kiera Cameron, a law enforcement who is from the 2077, searches for terrorists. Continuum stars Rachel Nichols. This was one of my favorite shows like Altered Carbon. Sadly, it ended mid-way through season 4. On the up side: they knew the cancellation was coming so it actually wrapped up nicely. The entire series is available on Netflix. Another one of my favorite TV shows like Altered Carbon, Dark Angel is a cyberpunk, sci-fi television series that aired on FOX for 2 seasons, from 2000 to 2002. Set in the year 2019, Max Guevara, a genetically-enhanced escapee from a covert military facility, is now an adult who is trying to live a normal life. That’s harder than you’d think in a post-EMP dystopian world where everyone is pretty much out to get you. Dark Angel stars Jessica Alba and Michael Weatherly. As you may know, Weatherly went on to star as Tony in NCIS, and now stars in the hit TV show Bull. Alba needs no introduction! If closure is important to you in a TV series, you might want to skip this one. It was cancelled abruptly at the end of season 2 and leaves you with a cliffhanger that will never be resolved. Defiance is an action, drama, sci-fi television series that aired on SYFY for 3 seasons, from 2013 to 2015. Set in the year 2046, Earth has been radically transformed with new alien species. Defiance stars Grant Bowler, Julie Benz (best know for her role as Darla in Buffy the Vampire Slayer) and Stephanie Leonidas. Dollhouse is a cyberpunk, drama, sci-fi television series that aired on cyberpunk, drama and sci-fi television series that aired on FOX for 2 seasons, from 2009 to 2010. The series centers around “Dollhouses,” which are futuristic, underground laboratories, responsible for programming people with temporary identities, personalities and skills. Dollhouse stars Eliza Dushku, Harry Lennix, Fran Kranz and Olivia Williams. It’s a Joss Whedon show, so you really can’t go wrong with it. Sadly, like Firefly, FOX didn’t quite realize the show’s potential and canned it after just 2 seasons. Revolution is a drama, sci-fi television series that aired on drama, sci-fi television series that aired on NBC for 2 seasons, from 2012 to 2014. Set in the year 2027, 15 years after a worldwide electrical blackout, a group of people try to stop a force that is posing as government officials. Revolution stars Billy Burke, Tracy Spiridakos, Elizabeth Mitchell, David Lyons and Giancarlo Esposito. I love this one because it makes you think about what you would do if the power went out all over the world. I like to hope society wouldn’t devolve to the point that it did in Revolution! Terminator: The Sarah Connor Chronicles is an action, drama, sci-fi television series that aired on FOX for 2 seasons, from 2008 to 2009. It is a spin-off of the Terminator movies and follows the events of the 1991 movie- Terminator 2: Judgement Day. Sarah Connor and her son, John Connor, attempt to destroy a computer network, to prevent Armageddon. Terminator: The Sarah Connor Chronicles stars Lena Headey and Thomas Dekker. Dekker also appeared in another one of my favorite short-lived series, The Secret Circle. Of all the shows like Altered Carbon on this list, I’d have to say that The 100 tops my list of favorites. The 100 is a drama, dystopian, sci-fi television series that has aired on The CW for 4 seasons so far, premiering on March 19, 2014. It is based on the 2013 book- of the same name- by Kass Morgan. Set 97 years after a nuclear war, the series follows a group of teenagers, from a space habitat, who are now living on Earth. The 100 stars Eliza Taylor, Paige Turco, Devon Bostick, Lindsey Morgan and Thomas McDonell. The Expanse is a drama, mystery, sci-fi television series that has aired on SYFY for 2 seasons so far, premiering on November 23, 2015. It is based on the series of 7 novels by James S. A. Corey. Set 200 years in the future, police detective, Joe Miller; ice freighter officer, Jim Holden and United Nation executive, Chrisjen Avasarala, work together to uncover a conspiracy that threatens humanity. The Expanse stars Thomas Jane, Steven Strait, Wes Chatham and Paulo Costanzo. Any of these 10 TV shows like Altered Carbon will take you on a wild ride through a sci-fi wonderland. As I mentioned above, The 100 is definitely my #1 favorite, but Dollhouse and Dark Angel follow close behind. What are some of your favorite sci-fi TV shows like Altered Carbon? Tell me below!